I know that I have heard and read, time and again, about the importance of breakfast. It helps to fuel the start of the day and from what I have read gets your metabolism restarted (from 'idling' overnight). No matter the hurry we face, we always make time for some form of breakfast to start our day. At our house, breakfast is frequently a meal that is eaten as individuals and varies widely from person to person and day to day. Breakfast can consist of cereal, or Oatmeal, or toast, or English muffins, or a bagel, or protein bar, or protein shake, or cinnamon rolls, or perhaps a traditional hot breakfast, or be as simple as a banana. Sometimes, it even consists of a few of these items. On school mornings, timing can be a challenge. I am usually trying to get upstairs after my workout class to get my shower and head off to school when my kids are ready to eat breakfast. This can be a real struggle if they are undecided or want to choose a different type of cereal from our stash. I tend to take my breakfast to go, consuming a shake on my drive and a banana later in the morning. Weekends allow for a more relaxed pace (usually). This is when making a batch of Cinnamon Rolls for the kids or pancakes or bacon and eggs can be a reality, although the truth is even that is still rare. I really love breakfast foods though, which is probably why I tend to make them a lot for dinner! 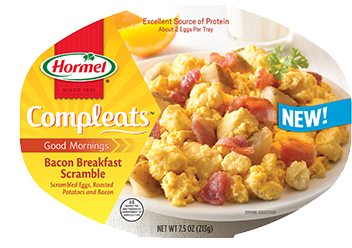 The new Hormel Compleats Good Mornings might just be a quick way to enjoy a warm breakfast any day of the week (or time of day). We have had a chance to try the Apple Cinnamon Oatmeal and it was a nice change of pace. We also have a couple of the other varieties, but haven't yet given them a try. What would you do with the extra time you save with Hormel® Compleats® Good Mornings? Wow I love breakfast food and those sound tasty!